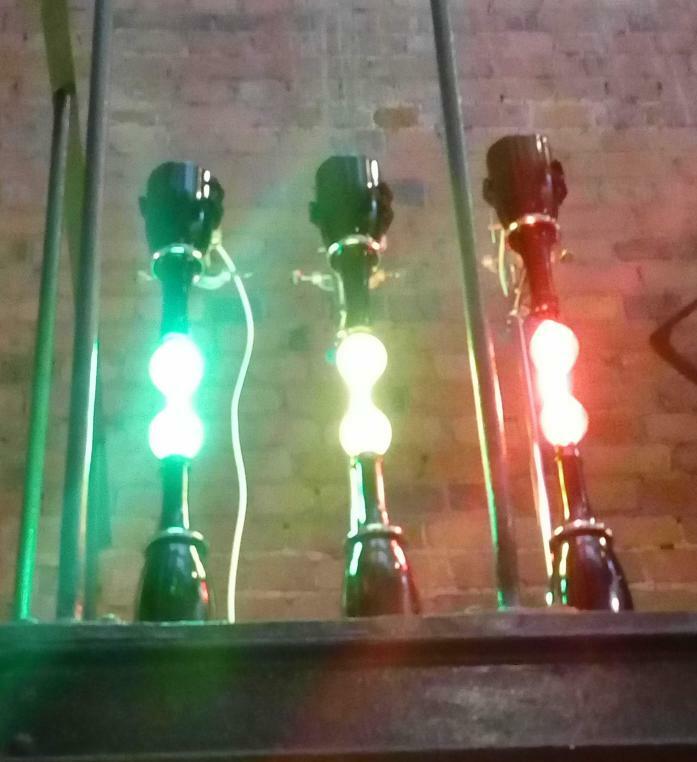 Is Meantime Brewery’s latest publicity wheeze a tiny bar or a bijou art gallery? 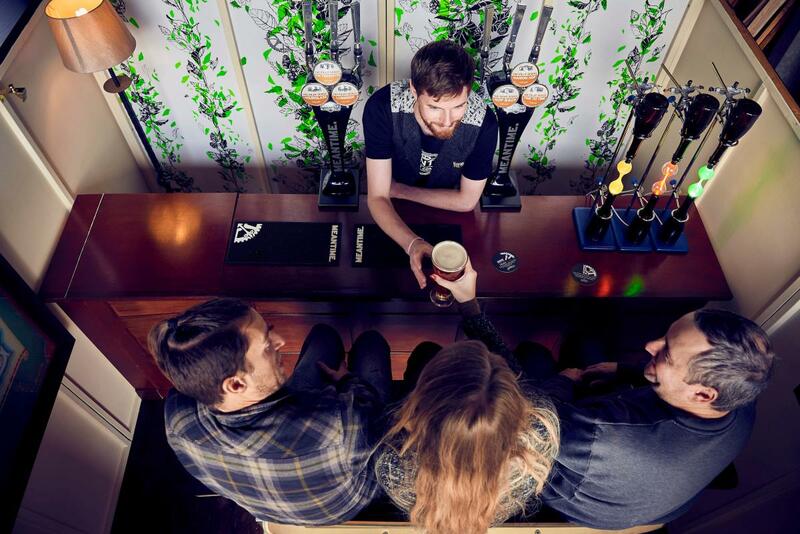 A bit of both really – the art side is because the 6ft by 8ft (1.8m by 2.4m) bar in the pop-up pub, which is called the Make Time For It after Meantime’s current promo campaign, has been furnished and decorated by six rather excellent artists and craftspeople from around Britain. The guests – a maximum of three, although I’m sure you could fit more in if they stood – sit on a bench created by from recycled material by furniture designer Liam Hopkins of Manchester’s Lazerian, drink from pint glasses designed by James Adlington and hand-blown at his Bristol Blue Glass workshop, and the bar is lit by a neon installation created in Leeds by Julia Bickerstaff of Neoncraft. Even the wallpaper is bespoke – designed by Marion Parola and Yvonne Elliott of Bespoke Atelier in Glasgow, it features climbing greenery to evoke hopbines, with the trademark Meantime cogwheel peeping out here and there. 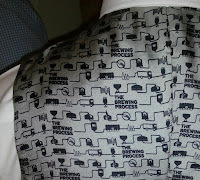 So too is the bartender’s waistcoat, designed by Brighton tailor Gresham Blake, and including specially woven “brewing process” fabric. The finishing touch is a gorgeous gilded pub mirror from London-based creative signwriter Ged Palmer’s Luminor studio. Equally important, the beer is bespoke as well – Meantime brewer Ciaran Giblin sat down with each of the artists to create a beer around them and brew it on Meantime's pilot brewkit. “I was told ‘You’ve got to get the personality of the craftsman into a beer,’ which I thought was a bit of fun,” he explained. Sadly, although it’s a temporary pop-up bar and is therefore portable – they claim it fits in the back of a Transit van* – it wasn’t present at last week’s press launch in the clock tower above London St Pancras station. The artworks and beers did though, except for one which had already run out, and so did most of the creators involved, all of whom had enjoyed the process. “Ciaran talked to us and got a sense of how we work,” said Marion Parola. She added that since she’s French and Yvonne is Scottish, he came up with a dark Scotch ale aged in Cognac barrels and then blended back with young beer – the rich and smooth result, called Maison Hop, was probably the star of the five we got to sample. 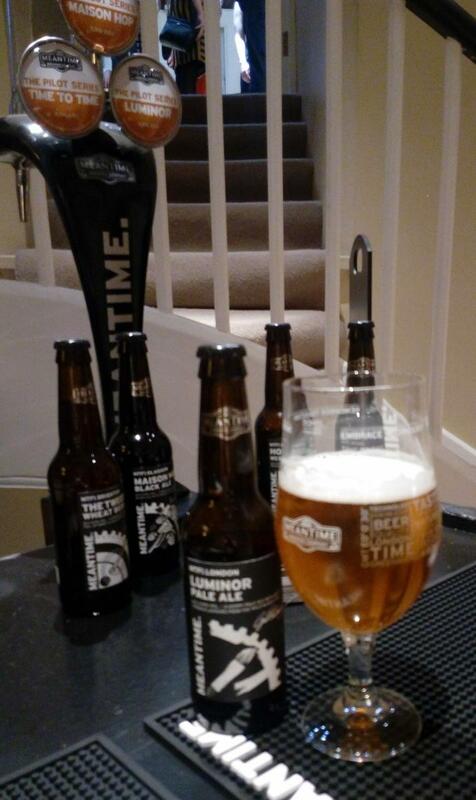 One demand Meantime put on the creatives was that they had just six weeks to do the job – this was to tie in with the six weeks that it would take to brew their beer from start to finish, and it’s what the Make Time campaign is about. It seems that brewers everywhere are noticing that fast and cheap may please the accountants, but it doesn’t keep drinkers happy (Anheuser-Busch has even resorted to plagiarising a rival’s advertising campaign on the subject, as Pete Brown angrily and amusingly alleged on his blog last week). My one problem with the whole project was that the creatives weren’t paid for their work, unless you count getting a few cases of ‘their’ beer. As a freelance, I’m not a big fan of working for ‘exposure’ as it’s quite hard to spend... 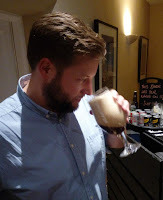 Sometimes though you do stuff, and it doesn’t matter that it was free because it was fun and you got something else useful out of it – a bit like writing this blog, really. And that’s how signwriter Ged Palmer approached it. “It took me months to get over doing things for exposure,” he laughed. “But at least with this I get a beer with my name on it!” He also got to work with loose gold leaf which he enjoys doing, and like the others he got a gorgeously filmed and edited promotional video showing him at work – you can find these on YouTube or the Meantime website. *Long wheelbase, rather than short, I suspect! Might this publicity stunt be the most pretentious bit of nonsense ever to be associated with beer? Yes, indeed it might! I visited it this afternoon, and while the artworks are still lovely, they look pretty incongruous, plonked in what's basically a dressed-up B&Q garden shed. I blame Readersheds.co.uk and the Shed of the Year competition for giving Asahi's marketing people silly ideas. It's odd to see anything associated with Meantime Brewery not to have Alistair Hook involved in some way. 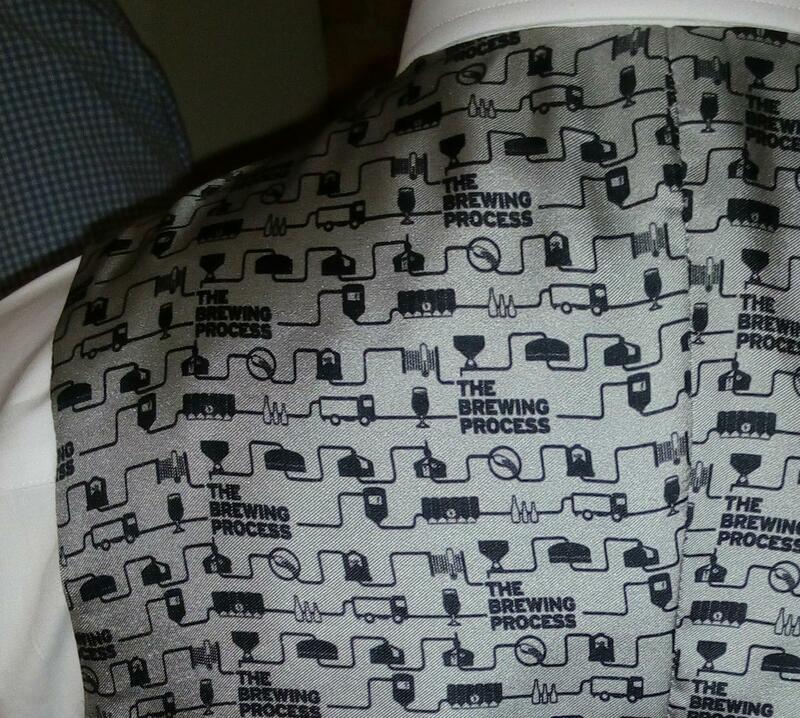 He was the face of the brewery since its inception. I don't ever see a mention of him on their website. Is he still involved with the company? I heard he was at the launch party, though I didn't get to speak with him and I don't know what his level of involvement is since cashing-in.